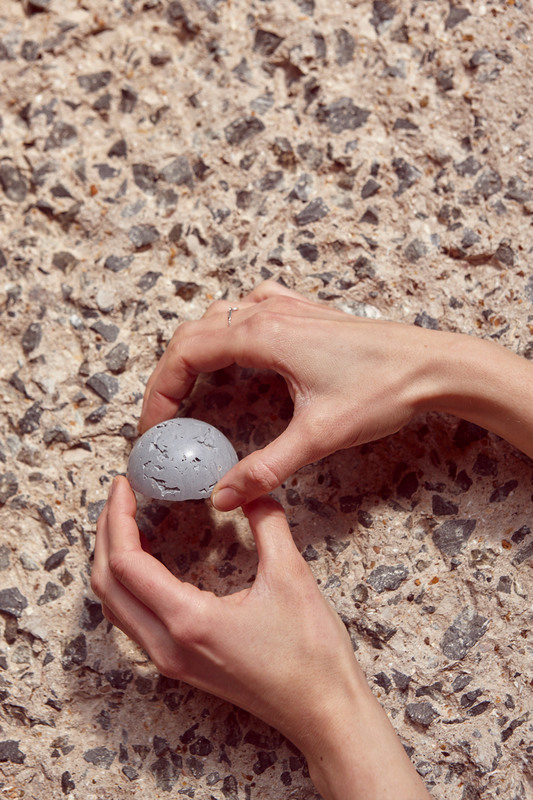 Goldsmith-turned-pâtissier Kia Utzon-Frank has designed a series of flødeboller sweets inspired by the Barbican's brutalist-style architecture. In keeping with traditional Danish flødeboller, Utzon-Frank's half-sphere treats are comprised of a soft Italian meringue centre and a thin marzipan base, encased in tempered chocolate. 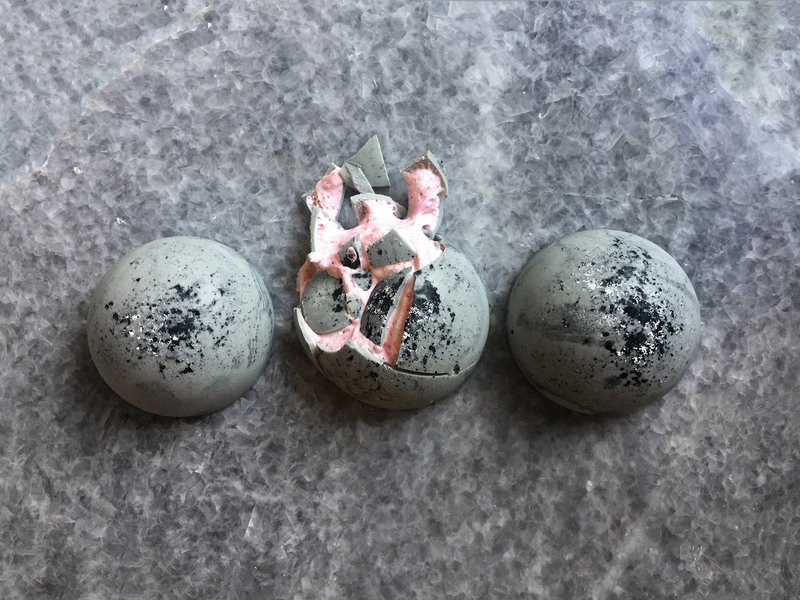 To give the desserts their varied stone-like finishes, she mixed white chocolate with natural black colourants and ground ingredients, like charcoal, black sesame, and Rice Krispies. "The concrete surface of the Barbican has been hand-chiseled to obtain its look, which is absolutely mind-blowing and utterly insane, so imitating concrete surfaces was, for me, the natural approach," Utzon-Frank told Dezeen. 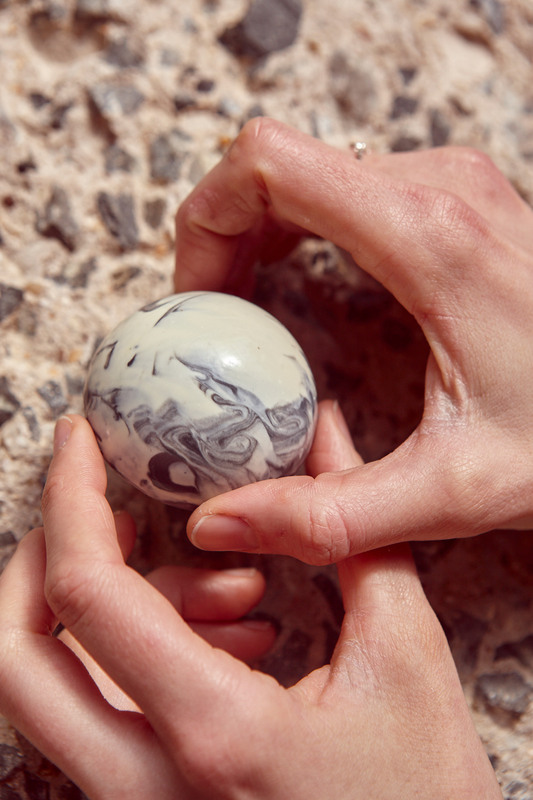 The flødeboller come in an array of geometric shapes such as cubes, pyramids, and half-spheres, as well as in a variety of textures and designs – including a marbled and speckled design, and a rocky, concrete-like surface. 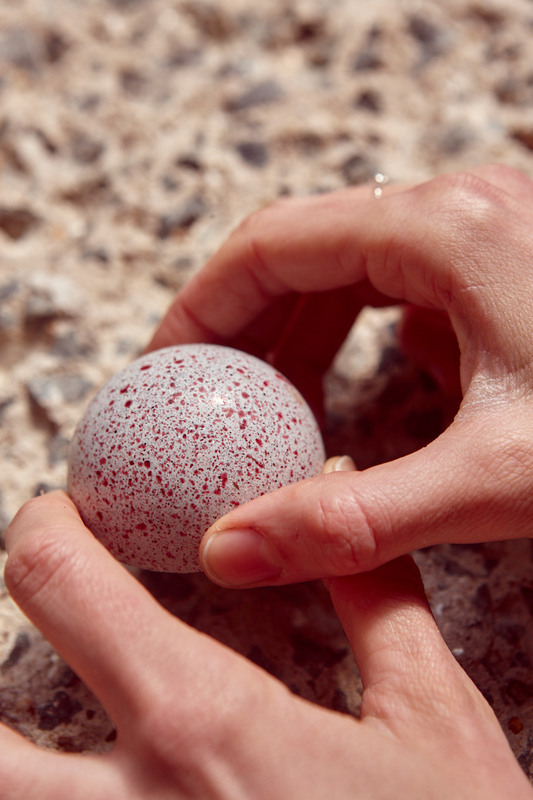 The London designer wanted to focus on the contrast between the inedible appearance of the flødeboller shells and their soft, marshmallowy interiors that are discovered after biting into them. After training as a goldsmith and designer at the Royal College of Art, Utzon-Frank founded her multifarious KUFstudios in 2016, where she creates a wide variety of products from patented window blinds and marble sculpture cakes, to gradient jewellery and iridescent hanging mobiles. "I am all about new connections between different fields of work, and working in fields I don’t know anything about," the designer told Dezeen. "Making geometric flødeboller that look like stone is not normally in the realms of what a trained goldsmith would make a business of, but with architects for parents, and sculptors for grandparents and great-grandparents, making sculptural, architectural desserts came pretty naturally to me." After working on some brutalist-inspired paper-engineering classes for the Barbican, the London arts centre approached Utzon-Frank to see if she could make brutalist-inspired specialised desserts and edible designs. 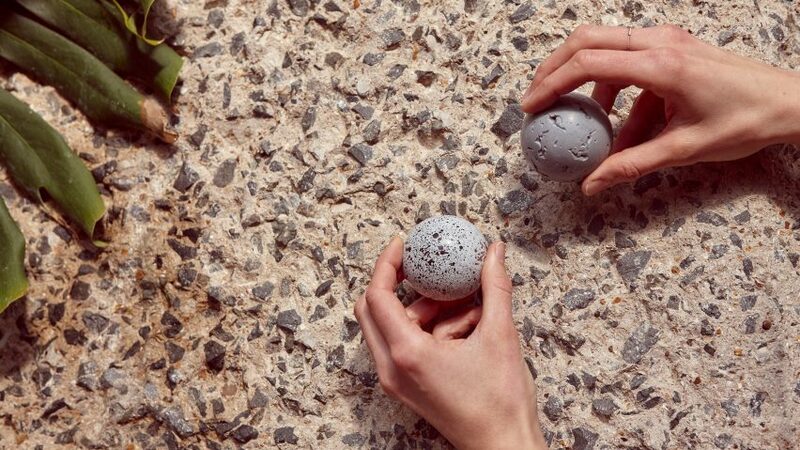 "It immediately sparked a billion ideas and I spent the next couple of days in the kitchen trying to make chocolate look like concrete, to then make it into flødeboller," she told Dezeen. 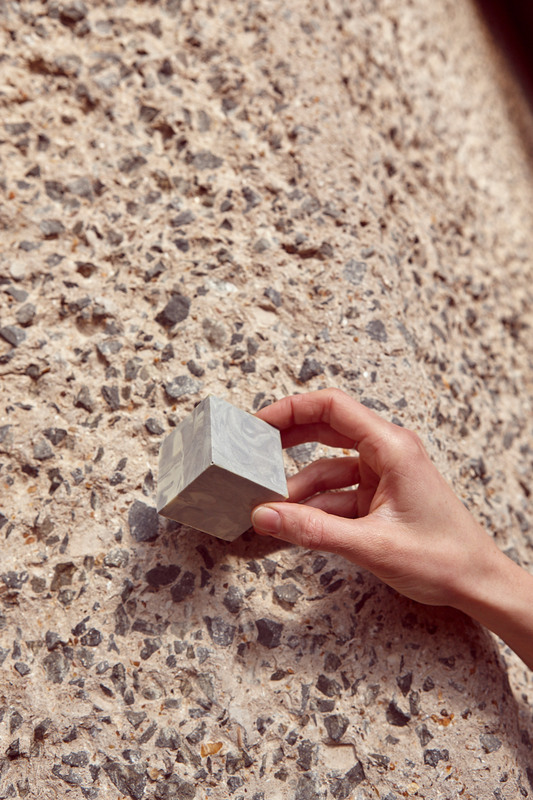 The brutalist-inspired flødeboller are not Utzon-Frank's first experiment in creating stone-like surfaces, as she previously made a set of sculptural cakes that look like blocks of solid polished stone for the 2016 Clerkenwell Design Week. At the moment, the flødeboller cannot be purchased anywhere. The only way to acquire some is to learn to make your own at Utzon-Frank's masterclasses in KitchenAid’s Central London store. Photography is by Louise Samuelsen.